Larva Description: The larval stage typically lasts 6 to 12 days, and the pupal stage for 9 to 16 days. The larvae and pupae are small and a non-descript white color. Ecological Threat: Any Texan who has walked through a field and seen dozens of red fire ant mounds knows the destructive power of the red imported fire ant. Not only are the mounds unaesthetic, but they can ruin lawns, and more ecologically important, they can displace native ants from their habitat. These native ants, including the Texas leaf-cutter ant, the harvester ant, as well as the carpenter ant are out-competed and even face hostility from red imported fire ants. This has led to a reduction in population numbers of all indigenous ants. Birds, especially those that are ground-nesters such as the Bobwhite Quail are vulnerable to the Red Imported Fire Ant. The ants are notorious for eating newly-hatched chicks, or destroying unhatched eggs. Any unfortunate insect, lizard, bird, mammal, or amphibian that is unlucky enough to disturb a Red Imported Fire ant mound is sure to be attacked and are often killed. Red imported fire ants attack very quickly and in great numbers, as many humans who have accidentally stepped on a mound will attest. 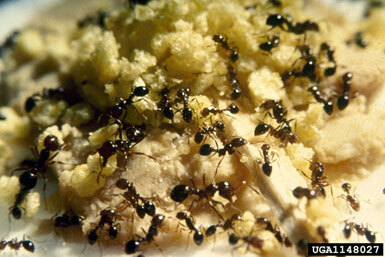 In addition to their ecological effects on native fauna, humans are impacted economically by the Red Invasive Fire ant. Lawns, ranches, or other lands can be permanently altered by the Red Imported Fire ant because of their ability to build many mounds in a clustered area. It is not uncommon to see an entire field dotted with large Red Imported Fire ant mounds. Biology: Red imported fire ants are prolific breeders and aggressive feeders, which makes them a successful invader. Mounds can be hundreds of thousands of individuals strong, and multiple queen colonies exist whose individuals can move between mounds freely which ultimately leads to an increase in the number of mounds that may be found within an area. Thus, Red Imported Fire ants are able to take over an area rather quickly by turning fields into homogeneous, desolate wastelands comprised of dozens of Red Imported Fire ants mounds. Most Texans have observed this phenomenon, possibly in their own backyard. History: The red imported fire ant was introduced around the 1930's and has spread to infest more than 260 million acres of land in 9 southeastern states, including all or portions of Florida, Georgia, South Carolina, Tennessee, Alabama, Mississippi, Arkansas, Texas, and Oklahoma. This species has become very abundant, displacing many native ant species when abundant. It has the potential of spreading west and surviving in southern Arizona and along the Pacific coast north to Washington. Native Origin: South America, specifically Brazil. U.S. Present: Currently, the red imported fire ant has established in many U.S. states, especially those in the southeast, as far north as North Carolina. The ants are found all across Texas, and in California. The red imported fire ant is found all across Texas, especially in the southern and southeastern counties. Adams CT, Plumley JK, Lofgren CS, Banks WA. 1976. Economic Importance of the red imported fire ant, Solenopsis invicta Buren. I. Preliminary investigations of impact on soybean harvest. Journal of the Georgia Entomologist Society II: 165-169.